It’s always useful to know another language. If partner and I could have been “talking Italian” with our hands in a recent tournament at Quodlibet then, although Robert De Niro might not have been waiting for us as well as for Bananarama, we would surely have avoided a big fat zero. With 4 of the 5 key cards between us what could possibly go wrong? The opponents wasted no time getting us down. South made the killing lead of a Diamond, which was really brave of her as it was under her King. A lead in any another suit would have allowed the slam to make as I would happily draw trumps and throw all my losing Diamonds on the Clubs and Hearts. North played the Ace of Diamonds and I desperately tried to persuade her to switch suits by dropping my Jack. No chance, back came another Diamond to the King and the contract was down one right away. In this method shows interest in slam with an Italian cue bid promising control in Clubs (i.e. Ace, King or void). These cue bids are made “up the line” i.e lowest controlled suit first, so here Clubs are mentioned before Hearts. As cue bids are “up the line” partner now knows Diamonds are not controlled and exits us safely at the 5 level. So although the classic Losing Trick Count (LTC) evaluates our hands as worth 14 (!) tricks or, alternatively, the New Losing Trick Count evaluates them to be 12 tricks, there is no Diamond control so we must not be tempted to bid slam. At least we knew enough Italian for our signalling when defending the next hand. „Robert De Niro’s Waiting…“, song by Bananarama released 20 February 1984 with the line “Talking Italian”. Mean with money or scores, this is the player that quits as soon as he is ahead, without giving his opponents a sporting chance to recover their losses. He doesn’t realise it is not a profitable strategy for him because he will keep on playing when he is on a losing streak. When he is ahead but has to keep playing as in a tournament or team game he stops concentrating or showboats, much to the frustration of partner or his team mates. Tip: If he is your opponent and is losing, then encourage him to continue and even suggest he takes a “double or quits” approach back to profitability. Shakespeare doesn’t mention if Shylock was a bridge player. However at the card table there are merchants, if not from Venice, who are merciless in demanding punishment for even the most unimportant of rules violations, and so take joy in frequent cries of “Director!”. Naturally any leeway you give to such a player when he breaks the rules is not acknowledged. Tip: Be on your toes to avoid incidents and tell the player himself when he breaks a rule. Since those that give it out rarely like getting it back. We may all be seen as an unobservant player at times; since the cards that you hold give you a unique view, what is blindingly obvious from one person’s perspective can be a total mystery from another’s. However some cases can be avoided such as being either unwilling or unable to make coherent suit preference signals to partner when defending, not realising that both declarer and dummy are void in a suit so that leading it will provide a gift-wrapped present of a ruff and discard, or not being suspicious of a suit that the opponents have made into a Trojan Horse should you touch it. Tip: Keep your eye on the ball! We often meet the litigious player. He is the one that loves an argument. Not only with his opponents over an infringement of the rules, real or imagined, but also with his partner usually over interpretation of a detail of their bidding system. Tip: As he is fuelled by dispute, if you choose not to engage he will soon run out of steam. A good bad player may seem to be lucky at bridge in that he does not always follow the rules that experience has shown will lead to best chance of maximising his trick count. However he makes up for this by a good appreciation of the hands and in avoiding unpleasant surprises. As declarer he is happy to cash his tricks for game rather than risk all for an over-trick. As defender he will never be caught with an unplayed ace or king in hand at the end. Tip: If he is your partner then relax and let him do his thing. This is a person who undoubtedly plays well but does not always score well. How can this be? The reason is although he never makes terrible errors, he does not have a good feel of when to be bold and when to be cautious. He will make a game plan but nor change it when warning signs appear. He tries too hard to show his skill so that when there are two ways of finishing a game he will usually choose the most complicated. It is good policy for whatever you are supposed to be doing that you do give it all of you attention when you are doing it. Nothing is more annoying than to see your partner take his eye off the ball for no reason so that he fails to make a cold contract, or a fail-safe defence. It is even insulting when your partner is a good player and makes mistake after mistake only to excuse himself by saying he was thinking of something else. Tip: Tell your partner what great player he would be if would care to concentrate! This player is skilled in the art of making partner pleased. He never, never, never blames partner. Instead he uses phrases like “Perhaps it would have been better..” and “I think you are right partner” (when he knows partner is wrong). He feels bad teaching partner how to play better, and indeed since bridge is a partnership game, keeping the union happy goes a long way to getting good results. Tip: While you may not always believe him he is certainly a pleasant person to be with. The unpopular play is easy to identify. Basically he is an excellent player in a club otherwise consisting of average players and he is a person who gives his analysis of others defects frequently and loudly. Understandably, this information is not always welcomed. This one keeps you guessing. Seemingly incapable of following a system you wonder how he deals with all the other areas of his life. His cards are a mystery to all other players including partner. Reminds one of the story of the pair having terrible results and when the man had to go to the WC his partner remarked “Well at least now I know what he is holding in his hand”. Tip: don’t worry making mistakes yourself as either he will not notice or not remember. Superstition manifests itself in bridge in a variety of forms. One player may have a favourite seat (mine is East) which may depend on the way the wind is blowing. I read of a player who thought it unlucky to hold the four of clubs and conversely another who was always happy to pick up the ten of hearts. Quite common is the horror of being declarer in a no trump contract as possibly the psychological damage of previous disasters can be permanent. Tip: Do whatever works for you. A selfish person is easily detected after a few hands of bridge. This is a person who seems to consider a trick won by him is worth two won by his partner. He’s hurt if a trick in his hand is sacrificed even though it lets the partnership win two tricks. As by not discarding his high cards in the suit you are running he will often block it. Tip: Be patient and maybe he will see the benefits of a sharing, equal partnership. The inspired player is a partner who has an amazingly accurate picture of your hand while you are playing it and a very good understanding of how the hands will work together. He is not fooled by opponent’s false cards nor mislead by those done by his partner. As well as knowing exactly how much to trust partner’s skill or lack of it he knows the rules and, more importantly, when to break them. Tip: If such a person is your partner then hang onto him! Conclusion: we all have our little ways and do things that are in our nature. Most of us are unwilling or unable to break our habits. But it is hoped that knowing what type of player you are yourself as well as the others you meet the bridge table will bring some amount of tolerance and enjoyment to your games. Excitable, crafty or just unlucky? These are types of bridge players that you have undoubtedly met already. Every card player has a certain style. The styles are very different but you do tend to see the same types again and again. Over 100 years ago a list of 26 types was proposed in a book on Whist (The Art of Practical Whist, General Drayson, 4th Ed. 1886). They still apply to bridge today – see if you recognize them in others or indeed in yourself. 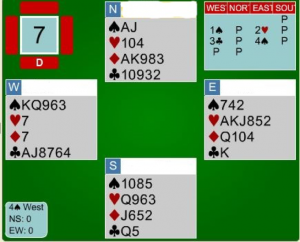 This player learnt bridge in the ‘80s, and thinks that’s all he needs to know. He is not interested in any changes that have happened to the game since then. A diehard Refusenik who treats such new‑fangled things as the Rule of 20, seven card fits and even Weak Twos with disgust. Tip: If he is your opponent then throw all the new stuff you know at him and watch the shock and awe begin. He may not be young in years but is inexperienced in the great game of bridge. Such players can be divided into two classes: the humble and the arrogant. The humble ones actually listen to advice and act on it to become a welcomed partner and feared opponent. The arrogant ones will argue, ignore any hints and tips and even worse, lecture other players on what they should have done. Tip: If he is your opponent then encourage him to stay in his seat by sympathizing with his “bad luck”. Your percentages are guaranteed to rise steadily. The player who has never read a bridge book will usually tell you this proudly, but if he has not then you will find out very soon from his bids and play. He skipped the slow learning process that the masses have followed and has taught himself everything believing that he is excellent. Tip: As when spotting a self-taught skier on the piste, one’s safest action is to put as much distance between you and him as possible. This player has a Bible and that is his bridge book. He will never stray from the divine path. He’d rather go down playing by the book than make a contract by breaking a rule. On one hand he is a good reliable partner but on the other hand everyone (including the opponents) will get a very clear picture of his hand. Favourite saying is “Read the Book, Read the Book”. Tip: If he is your partner then have faith and read the book (there is no other option). This player is someone with an over-developed sense of self-esteem who will struggle hard to prevent it being in any way lessened. So when making a mistake at bridge he will claim he only plays for fun. Which is rather rude, as it implies others are making a business out the game whereas it is below him “like a philosopher playing at marbles” and he would of course be a good player if only he bothered. Tip: Tell him you’d appreciate him finding his fun elsewhere. Treasured as a partner and feared as an opponent, this player delights in playing in deceptive ways. For him each trick stolen is twice as sweet. Misleading bids, extra deep finesses, and underleading Aces are all meat and drink to him. Good at estimating player’s ability, his craftiness even goes as far to not pointing out defects in his partner’s play – in case his partner will be an opponent in a future tournament. Tip: Be prepared for a frenzy of false carding that misleads opponents and partner alike. Although we know in our heart of hearts that the cards really are dealt randomly and so no-one will consistently get better cards than anyone else, there do exist players with the reputation of holding a good hand. This is because they play so well that they win more with good cards and lose less with bad cards. If you are envious of their ability then some consolation may be had from informing them of the saying “lucky in cards unlucky in love”. Tip: Try to get this unloved person to be your partner. As this player cannot accept his poor results are down to bad play he fervently believes he is a victim of the invisible power called bad luck. Even when a finesse fails it is not by chance but due to bad luck working against him. Although this can be a satisfying philosophy that attaches no blame to his level of intelligence or skill, since believing in it gives him no hope of ever getting good results, one wonders why he continues to play at all. Tip: Cheer up this unfortunate by telling him he must be lucky in love. Every bridge club has at least one person who has assumed the role of the expert and is fond of dispensing his wisdom – often unasked, usually to his hapless partner but sometimes to the opponents as well. It can be quite painful to observe such scenes especially when the advice given is quite wrong. An intelligent bridge authority will in fact keep his winning knowledge to himself and his regular partner and not share it with the opponents to their advantage (as will the Crafty Player). Tip: Be respectful of his advice but be careful following it, especially if he is not winning regularly. An excitable player is a dangerous partner. His mood infects all at the table: you are excited (actually highly stressed) about what on earth he will do next, and the opponents are excited about their good likelihood of getting extraordinarily high scores. You’ll see: rapidly escalating bidding, hasty leads, overlooking significant actions by the opponents, and playing a card too soon – all are just some of the many signs that you’ve got a wild one facing you. Tip: If he is your partner then slip some Valium into his tea during the tournament break. No player drains one’s energy more than this one. Presumably a believer of the fable of the Hare and the Tortoise he peers out of his shell at the dealt hand with great suspicion. And if you thought he took an age to pick up and sort his cards, just wait until he plays them. And wait some more. It is hard not to believe that his long and meaningless delays (e.g. which card to play when it is a singleton) are not a tactic to drive the opponents to distraction so that they deliberately lose their tricks just to finish the game. Tip: Take the Valium yourself. When a disaster happens, as it always does at least once in a tournament, this player does not want to know why nor discuss how to prevent it happening again. Like the Bourbons of whom it was said “they have forgotten nothing and learned nothing” he may push back by claiming you made an equally awful mistake in a previous tournament, as if that in any way justified what he has done. Possibly the most exasperating partner to have is this one who seems incapable of counting to 13, remembering what was lead or been played, and is fond of an extra round of trumps “just to make sure”. Favourite saying is “Well, I thought that…” closely followed by “Sorry”. Tip: Screaming at partner will not improve his memory. Instead try to prevent him from being declarer or present him with a hopefully foolproof defence. Coming in part 2 are the 13 remaining types of players including “The Good Bad Player”, “The Bad Good Player” and “The Man with the Pre-occupied Mind”….